When my canary died last April 2005, my heart broke. I have only had 2 birds in my life and they were both canaries named St. Nicolas. My husband Bill decided to buy me a new little canary for my birthday last May, he took me around town to every bird and pet store, and even a seed and feed store. My heart decided on these two little birds we saw at a local bird and pet store. I have never seen such colorful birds. I had them both named before we left the store. The store owner assured us that these little birds would lay eggs but they are bad parents, and we would never see babies. 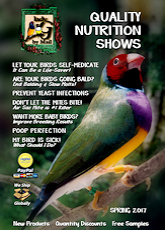 The store owner then told us that he receives his birds from a breeder that uses a society to hatch Lady Gouldian eggs. That was all we need to hear, we took the little birds into our heart and home. Well, over the summer Willamena laid 28 eggs in her nest, both birds did not pay much attention to eggs, so I would just take them out after a week or so. 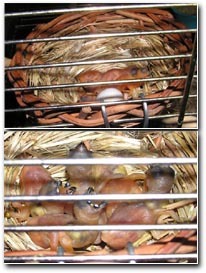 I had a canary nest instead of a finch nest, I did not know that was the wrong nest for them. 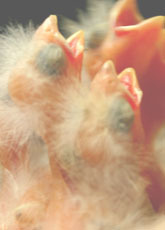 It became late fall, and I asked the pet store owner what to do about my birds, they are still laying eggs. He told me that the days were getting shorter and they would stop laying soon, I asked him how long it takes to hatch an egg? 21 or so days was his answer. Willamena laid 6 more eggs that same week, I noticed that Ed was sitting on the nest all the time, and I did not have the heart to take them away from him. I looked in the nest and saw only 2 eggs. To my surprise I saw 4 little babies on the bottom of the cage. 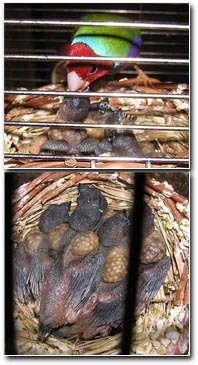 I quick picked them up and put them back in the nest and told Ed and Willamena not to do that again, these are your babies!!! 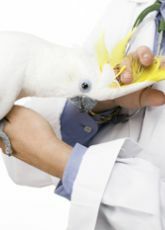 I called the pet store with my exciting news, they too were surprised and told me not to get to excited about the birds, since I touched them when I put them back in the nest. On the next day one of the eggs was broken and tossed out, and the last egg Willamena had in her beak and shook out the 5th baby. In the week to come I would watched the parents take turns sitting on and feed their new family. One day I noticed that all the babies had these tumors on their necks! My husband told me to look on the internet for information on our birds. 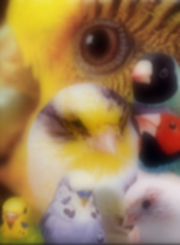 I found ladygouldianfinch.com and sent an email off to Dr. Rob. I was a little embarrassed when I found out the answer, but at the same time very happy - Thank you Dr. Rob! Its been 7 weeks and my husband Bill and I are so in LOVE with our new little family, I keep the birds up past their bed time so Bill can see them when he gets home from work at night. Its funny how they seem to know us and are happy to see us too! 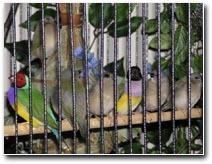 Bill and I are both busy reading up on Lady Gouldians Finches and sending out photos to all of our family and friends. Ed is a camera hound and seems to pose in front of it, Willamena hates it. 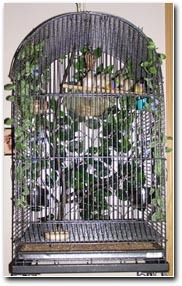 Our little family now has a new home, we bought them a parrot cage (I know! I know!!! that's a big cage, but they deserve it!) They are all having so much fun in there new home, I have placed some silk leaves, flowers and even a small tree with lots of branches to hold all the birds. They spend their days picking at the silk flowers, that's big fun for them. They are all feeding on there own, but Ed still feeds them, and they are happy for it. Willamena is a spoiled bird, she will help out sometimes, but Ed seems to do all the work. We have now bought them the correct nest... No more canary nests, Ed, Willamena and the babies love it, they all have had turns sleeping in the nest and hopping all over it. What do we do now with all these birds? I'm sure there is more baby birds to come!